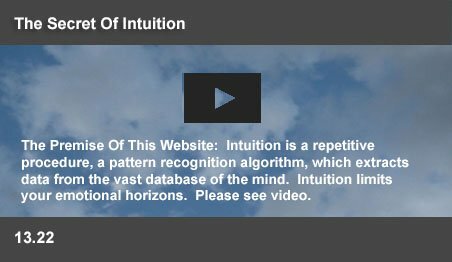 Intuition is an algorithm, which enables the mind to recognize patterns. Computers will, one day evolve to achieve a similar competence. In February 2011, IBM entered the next stage in evolution of the computer - pattern recogntiion, demonstrating the Watson Supercomputer, which recognizes patterns in text data to surpass the capabilities of the human mind. Evolution of the computer will bring it closer to the human mind, by developing an ability to understand. It is that unique ability to recognize, manipulate and remember events, which will be the next step in computer evolution. At present, “understanding” is the basic difficulty facing the efforts of the AI community to mimic human intelligence. Decades ago Alan Turing suggested a thought experiment, which suggested that outward behavior alone should be the criterion for building a computer, with human level intelligence. John Searle subsequently suggested a second thought experiment, which showed that internal understanding was also an element of human intelligence. Computers today lack a true understanding of the information they process. But, computers have already begun to recognize the patterns, which identify a few objects. Future computers could be programmed to identify and name all the objects around us. Simultaneous recognition of many objects would require a massive increase in memories. With simultaneous processing of exponentially larger memories, computers could begin to recognize video events. They could begin to recognize and verbalize event patterns. They could then add recognition of all sensory event patterns. Subsequently, they could categorize event patterns in terms of emotions. Computers would then recognize the complex patterns, which convey the concepts of human culture and art. They could then learn from the written pages of human history. With an ability to identify and verbalize its own internal processes, computers could begin to have self awareness. All this would require the simultaneous processing of unimaginably large memory capacities. A computer, with such capabilities, could truly understand. Decades ago, Alan Turing had defined the primary goal of artificial intelligence. A human judge could engage in an exchange of messages with one human and one machine, each of which tries to appear human; if the judge cannot reliably tell which is which, then the machine can be defined as being humanly intelligent. Turing suggested that it was not the internal state of either the mind, or the machine, but their outward behavior, which can define intelligence. But John Searle pointed out the main barrier to evolution of the computer. He suggested that along with outward behavior, understanding was also crucial. 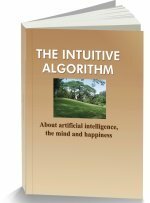 According to him, “strong AI” was impossible, because a computer, merely programmed to output seemingly intelligent messages, would still not equal a mind, because it could never truly understand those messages. Searle proposed a thought experiment, where an English speaking person in a closed room, accepts a message in Chinese through a window, follows certain instructions to return answers in Chinese. Since he merely followed the instructions, he had no comprehension of the transmitted messages. In the same way, since computers merely processed inputs without an understanding of their significance, they could never advance to the next stage in evolution of the computer - human comprehension. In the current stage in evolution, computers merely simulate thought, but lack any real understanding. Computers are not able to demonstrate such comprehension, since, in reality, they do not know the contextual meaning of a message. It is common knowledge that such a lack of comprehension can be revealed by even simple queries to a computer. Even though individual neurons do not know of the Chinese Room, the mind understands its implications. But this superiority of the mind may be short lived. In the next stage in evolution of the computer, they may overcome this weakness. At the beginning of evolution of the computer, the machines have limited memories and are unable to recognize complex patterns. When these limitations are overcome, computers may match human intelligence, with true understanding. Computer programs could begin with an ability to identify objects and events by analyzing and morphing video patterns. Analyzing the incoming patterns of light waves of a video clip, it could uniquely identify and name a glass on the table. The understanding stage in evolution of the computer could lead to recognition of event patterns, defining the changing relationships of objects over time, to code the output in sentences. From its video input, the computer could output “John placed the glass on the table.” Its programs would morph groups of video clips into a single activity, combining event sequences to create new events in its memory. Special circuits would structure the grammatical links between words in its sentences. Morphed sentences would output “John came home and drank water.” It could proceed to learn and retain in its memory, millions of such events, defined by such sentences. This phase in evolution of the computer would lead to the recognition of sentences, which defined a past, future, or imagined event. An advanced stage in evolution of the computer would depend on massive memories. Installed programs in the computer would the transfer millions of years of programmed emotional knowledge to categorize recognized events with feelings. It would identify events, which were sad, outrageous, or funny. With its emotional knowledge and the equivalent of a human lifetime of memories, it would identify the joy, sadness, or anger of John over the happenings in his life. It would recognize the context of a received message and meaningfully process requests. It could even be programmed to recognize its own internal processes, giving it a sensory awareness of itself. The intelligence of such a computer could one day equal, or exceed the intelligence of the one and a half kilograms of gray matter of the human mind. It would no longer matter, whether such a computer functioned through neurons, integrated circuits, or light waves. The understanding stage would have been reached in evolution of the computer. Evolution of the computer will inevitably lead to the development of massive memories. With such memories, computers will have immediate and contextual access to the trillions of such video images and the ability to process all those patterns in real time. Such a computer will recognize language and culture, music and dance, utilizing not merely visual, but multi dimensioned sensory memories. All the information in the one hundred million books of a search engine would probably occupy a whole city block. On this scale, the DNA codes in the human body, tightly packed into 500 page books, would fill the Grand Canyon fifty times over! At present, nature's stores of information are incomparably larger. But the mind stores all that information in a puny brain. With the ongoing miniaturization of memories, computers will also recognize events using a few thousand cubic miles of such coded memories. In the next step in evolution of the computer, the machines will be able to understand the meaning of this article.